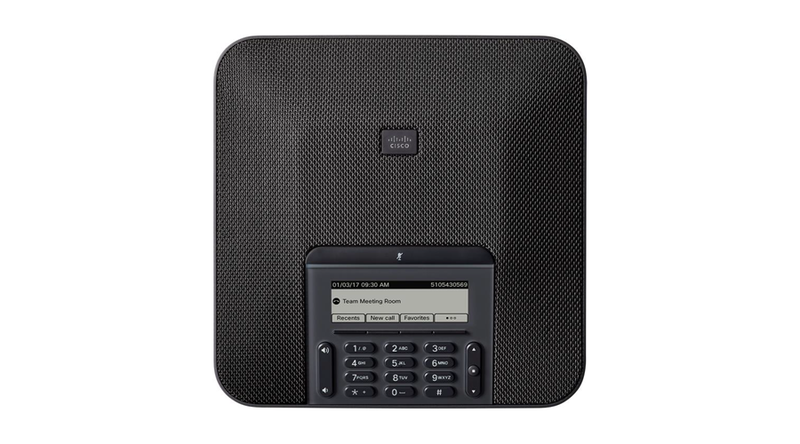 Includes Power Supply The Cisco IP Conference Phone 7832 enhances people-centric collaboration by delivering easy-to-use audio conferencing. It combines superior high-definition (HD) audio performance and 360-degree microphone coverage in a very sleek, approachable, and compact form, making it ideal for both small conference and huddle rooms and private offices, such as for managers and executives. Compact footprint design with 360-degree room coverage and no less than 7-ft (2.1-m) microphone pickup. 3.4-inch (8.6-cm), 384x128-pixel monochrome LCD with backlit LED and antiglare bezel. Large mute button for easy access from all sides of the device. Single line with a user experience of multiple calls per line, as on other 7800 Series phones. Codec support including G.711(u/A), G.729a, G.729ab, iLBC, G.722, and OPUS. IEEE 802.3af Power over Ethernet (PoE) Class 2 for low power consumption. An optional external universal AC power supply kit is available. The product is qualified by the Energy Star organization. Cloud-enabled with Cisco Spark. Features such as codecs, localized user interface, and calling features rely on Cisco Spark Call enablement.